Pioneers in the industry, we offer digital sleeve cutting machine (model: sl-666), digital sleeve cutting machine (model: sl-666plus ), heavy duty cutting machine (model: hdc-777) and corrugation tube cutting machine (ct-999) from India. 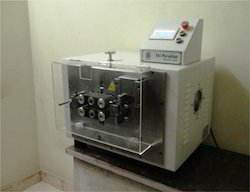 The setup and operations of the SL-666 is performed through the use of electronic counters, micro-process controls and hybrid stepper motors. Material guides are easily adjusted for different applications requirements. Multi-materials guides are also available to feed more than one material source for more productivity. Additional design features include a durable roller feed system and strong cutting mechanism designed for longer life and continuous operations. 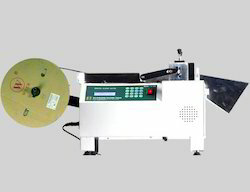 The SL-666 is an automatic measuring and cutting machine; and it can process flat round materials including of wires, cables, tubes, sleeves, tapes, labels, and screens and so on in PVC, heat-shrink, rubber, teflon, fibre glass, flat ribbon cables, and nylon materials to name a few. The setup and operations of SL-666+ is managed through the use of electronic counters, and PLC based controls and touch screen(HMI) with servo motors. Material guides are easily adjusted for different applications requirements. Multi materials guides are also available to feed more than one material source for more productivity. Additional design features include a durable roller feed system and strong cutting machine designed for long life and continuous operations. 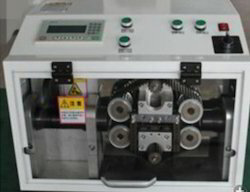 The SL-666+ is an automatic measuring and cutting machine. It will process flat and round materials including of wires, cables, tubes, sleeves, tapes, labels, and screens and so on in PVC, heat-shrink, rubber, teflon, fibre glass, flat ribbon cables, nylon materials to name a few. The setup and operations of the HDC-777 is performed through the use of electronic counters, and PLC based controls and touch screen(HMI) with servo motors. Material guides, tubes and cutting blades are easily replaced for different applications and requirements. Additional design features include a durable roller feed system and strong cutting mechanism designed for long life and continuous operations. SAI PARADISE corrugated tube cutting machines of the CT-999 series offer absolute precision with the cut on the crest of the corrugation. All types of corrugated tubes – slit, unslit, re-sealable or with muffs – are cut reliably and precisely. The corrugated tubes are used for protecting cables and wiring harnesses.